For the ocean liner, see MV Christiaan Huygens. In 1659, Huygens was the first to derive the now standard formula for the centripetal force in his work De vi centrifuga. The formula played a central role in classical mechanics and became known as the second of Newton's laws of motion. Huygens was also the first to formulate the correct laws of elastic collision in his work De motu corporum ex percussione, but his findings were not published until 1703, after his death. In the field of optics, he is best known for his wave theory of light, which he proposed in 1678 and described in 1690 in his Treatise on Light, which is regarded as the first mathematical theory of light. His theory was initially rejected in favor of Isaac Newton's corpuscular theory of light, until Augustin-Jean Fresnel adopted Huygens' principle in 1818 and showed that it could explain the rectilinear propagation and diffraction effects of light. Today this principle is known as the Huygens–Fresnel principle. Huygens wrote the first treatise on probability theory, De ratiociniis in ludo aleae ("On Reasoning in Games of Chance", 1657). He had been told of recent work in the field by Fermat, Blaise Pascal and Girard Desargues two years earlier, in Paris. Frans van Schooten translated the original Dutch manuscript "Van Rekeningh in Spelen van Geluck" into Latin and published it in his Exercitationum mathematicarum. It deals with games of chance, in particular the problem of points. Huygens took as intuitive his appeals to concepts of a "fair game" and equitable contract, and used them to set up a theory of expected values. In 1662 Sir Robert Moray sent Huygens John Graunt's life table, and in time Huygens and his brother Lodewijk worked on life expectancy. Huygens observed the acoustical phenomenon now known as flanging in 1693. He died in The Hague on 8 July 1695, and was buried in an unmarked grave in the Grote Kerk there, as was his father before him. Huygens designed more accurate clocks than were available at the time. In 1656, inspired by earlier research into pendulums by Galileo Galilei, he invented the pendulum clock, which was a breakthrough in timekeeping and became the most accurate timekeeper for the next 275 years until the 1930s. Huygens contracted the construction of his clock designs to Salomon Coster in The Hague, who built the clock. The pendulum clock was much more accurate than the existing verge and foliot clocks and was immediately popular, quickly spreading over Europe. However Huygens did not make much money from his invention. Pierre Séguier refused him any French rights, Simon Douw of Rotterdam copied the design in 1658, and Ahasuerus Fromanteel also, in London. The oldest known Huygens-style pendulum clock is dated 1657 and can be seen at the Museum Boerhaave in Leiden. Huygens motivation for inventing the pendulum clock was to create an accurate marine chronometer that could be used to find longitude by celestial navigation during sea voyages. However the clock proved unsuccessful as a marine timekeeper because the rocking motion of the ship disturbed the motion of the pendulum. In 1660 Lodewijk Huygens made a trial on a voyage to Spain, and reported that heavy weather made the clock useless. Alexander Bruce elbowed into the field in 1662, and Huygens called in Sir Robert Moray and the Royal Society to mediate and preserve some of his rights. Trials continued into the 1660s, the best news coming from a Royal Navy captain Robert Holmes operating against the Dutch possessions in 1664. Lisa Jardine doubts that Holmes reported the results of the trial accurately, and Samuel Pepys expressed his doubts at the time: The said master [i.e. the captain of Holmes' ship] affirmed, that the vulgar reckoning proved as near as that of the watches, which [the clocks], added he, had varied from one another unequally, sometimes backward, sometimes forward, to 4, 6, 7, 3, 5 minutes; as also that they had been corrected by the usual account. One for the French Academy on an expedition to Cayenne ended badly. Jean Richer suggested correction for the figure of the Earth. By the time of the Dutch East India Company expedition of 1686 to the Cape of Good Hope, Huygens was able to supply the correction retrospectively. Huygens analyzed this problem by finding the curve down which a mass will slide under the influence of gravity in the same amount of time, regardless of its starting point; the so-called tautochrone problem. By geometrical methods which were an early use of calculus, he showed it to be a cycloid, rather than the circular arc of a pendulum's bob, and therefore that pendulums are not isochronous. He also solved a problem posed by Mersenne: how to calculate the period of a pendulum made of an arbitrarily-shaped swinging rigid body. This involved discovering the centre of oscillation and its reciprocal relationship with the pivot point. In the same work, he analysed the conical pendulum, consisting of a weight on a cord moving in a circle, using the concept of centrifugal force. th the diameter of the Sun, and thus it was about 30,000 times as far away, on the (incorrect) assumption that Sirius is as luminous as our sun. The subject of photometry remained in its infancy until the time of Pierre Bouguer and Johann Heinrich Lambert. ^ I. Bernard Cohen; George E. Smith (25 April 2002). The Cambridge Companion to Newton. Cambridge University Press. p. 69. ISBN 978-0-521-65696-2. Retrieved 15 May 2013. ^ Niccolò Guicciardini (2009). Isaac Newton on mathematical certainty and method. MIT Press. p. 344. ISBN 978-0-262-01317-8. Retrieved 15 May 2013. ^ "Huygens". Random House Webster's Unabridged Dictionary. ^ R. Dugas and P. Costabel, "Chapter Two, The Birth of a new Science" in The Beginnings of Modern Science, edited by Rene Taton, 1958,1964, Basic Books, Inc.
^ Jozef T. Devreese (31 October 2008). 'Magic Is No Magic': The Wonderful World of Simon Stevin. WIT Press. pp. 275–6. ISBN 978-1-84564-391-1. Retrieved 24 April 2013. ^ H. N. Jahnke (2003). A history of analysis. American Mathematical Soc. p. 47. ISBN 978-0-8218-9050-9. Retrieved 12 May 2013. ^ Margret Schuchard (2007). Bernhard Varenius: (1622–1650). BRILL. p. 112. ISBN 978-90-04-16363-8. Retrieved 12 May 2013. ^ a b c d Dictionary, p. 470. ^ Christiaan Huygens – A family affair, by Bram Stoffele, pg 80. ^ C. D. Andriesse (25 August 2005). Huygens: The Man Behind the Principle. Cambridge University Press. pp. 80–. ISBN 978-0-521-85090-2. Retrieved 23 April 2013. ^ C. D. Andriesse (25 August 2005). Huygens: The Man Behind the Principle. Cambridge University Press. pp. 85–6. ISBN 978-0-521-85090-2. Retrieved 10 May 2013. ^ a b Dictionary, p. 469. ^ Lynn Thorndike (1 March 2003). History of Magic & Experimental Science 1923. Kessinger Publishing. p. 622. ISBN 978-0-7661-4316-6. Retrieved 11 May 2013. ^ Leonhard Euler (1 January 1980). Clifford Truesdell (ed.). The Rational Mechanics of Flexible or Elastic Bodies 1638–1788: Introduction to Vol. X and XI. Springer. pp. 44–6. ISBN 978-3-7643-1441-5. Retrieved 10 May 2013. ^ C. D. Andriesse (25 August 2005). Huygens: The Man Behind the Principle. Cambridge University Press. pp. 78–9. ISBN 978-0-521-85090-2. Retrieved 10 May 2013. ^ Joella G. Yoder (8 July 2004). Unrolling Time: Christiaan Huygens and the Mathematization of Nature. Cambridge University Press. p. 12. ISBN 978-0-521-52481-0. Retrieved 10 May 2013. ^ H.F. Cohen (31 May 1984). Quantifying Music: The Science of Music at the First Stage of Scientific Revolution 1580–1650. Springer. pp. 217–9. ISBN 978-90-277-1637-8. Retrieved 11 May 2013. ^ H. J. M. Bos (1993). Lectures in the History of Mathematics. American Mathematical Soc. pp. 64–. ISBN 978-0-8218-9675-4. Retrieved 10 May 2013. ^ C. D. Andriesse (25 August 2005). Huygens: The Man Behind the Principle. Cambridge University Press. p. 134. ISBN 978-0-521-85090-2. Retrieved 10 May 2013. ^ Thomas Hobbes (1997). The Correspondence: 1660–1679. Oxford University Press. p. 868. ISBN 978-0-19-823748-8. Retrieved 10 May 2013. ^ Michael S. Mahoney (1994). The Mathematical Career of Pierre de Fermat: 1601–1665. Princeton University Press. pp. 67–8. ISBN 978-0-691-03666-3. Retrieved 10 May 2013. ^ C. D. Andriesse (25 August 2005). Huygens: The Man Behind the Principle. Cambridge University Press. p. 126. ISBN 978-0-521-85090-2. Retrieved 10 May 2013. ^ Schoneveld, Cornelis W (1983). Intertraffic of the Mind: Studies in Seventeenth-century Anglo-Dutch Translation with a Checklist of Books Translated from English Into Dutch, 1600–1700. Brill Archive. p. 41. ISBN 978-90-04-06942-8. Retrieved 22 April 2013. ^ Robert D. Huerta (2005). Vermeer And Plato: Painting The Ideal. Bucknell University Press. p. 101. ISBN 978-0-8387-5606-5. Retrieved 24 April 2013. ^ Randy O. Wayne (28 July 2010). Light and Video Microscopy. Academic Press. p. 72. ISBN 978-0-08-092128-0. Retrieved 24 April 2013. ^ a b Dictionary, p. 473. ^ Margaret Gullan-Whur (1998). Within Reason: A Life of Spinoza. Jonathan Cape. pp. 170–1. ISBN 0-224-05046-X. ^ Ivor Grattan-Guinness (11 February 2005). Landmark Writings in Western Mathematics 1640–1940. Elsevier. p. 35. ISBN 978-0-08-045744-4. Retrieved 27 April 2013. ^ Thomas Hobbes (1997). The Correspondence: 1660–1679. Oxford University Press. p. 841. ISBN 978-0-19-823748-8. Retrieved 11 May 2013. ^ Garber and Ayers, p. 1124–5. ^ Anders Hald (25 February 2005). A History of Probability and Statistics and Their Applications before 1750. John Wiley & Sons. p. 106. ISBN 978-0-471-72517-6. Retrieved 11 May 2013. ^ Adrian Johns (15 May 2009). The Nature of the Book: Print and Knowledge in the Making. University of Chicago Press. pp. 437–8. ISBN 978-0-226-40123-2. Retrieved 23 April 2013. ^ Venus Seen on the Sun: The First Observation of a Transit of Venus by Jeremiah Horrocks. BRILL. 2 March 2012. p. xix. ISBN 978-90-04-22193-2. Retrieved 23 April 2013. ^ Jozef T. Devreese (2008). 'Magic Is No Magic': The Wonderful World of Simon Stevin. WIT Press. p. 277. ISBN 978-1-84564-391-1. Retrieved 11 May 2013. ^ Fokko Jan Dijksterhuis (1 October 2005). Lenses And Waves: Christiaan Huygens And The Mathematical Science Of Optics In The Seventeenth Century. Springer. p. 98. ISBN 978-1-4020-2698-0. Retrieved 11 May 2013. ^ Gerrit A. Lindeboom (1974). Boerhaave and Great Britain: Three Lectures on Boerhaave with Particular Reference to His Relations with Great Britain. Brill Archive. p. 15. ISBN 978-90-04-03843-1. Retrieved 11 May 2013. ^ David J. Sturdy (1995). Science and Social Status: The Members of the "Académie Des Sciences", 1666–1750. Boydell & Brewer. p. 17. ISBN 978-0-85115-395-7. Retrieved 11 May 2013. ^ The anatomy of a scientific institution: the Paris Academy of Sciences, 1666–1803. University of California Press. 1971. p. 7 note 12. ISBN 978-0-520-01818-1. Retrieved 27 April 2013. ^ David J. Sturdy (1995). Science and Social Status: The Members of the "Académie Des Sciences", 1666–1750. Boydell & Brewer. pp. 71–2. ISBN 978-0-85115-395-7. Retrieved 27 April 2013. ^ Jacob Soll (2009). The information master: Jean-Baptiste Colbert's secret state intelligence system. University of Michigan Press. p. 99. ISBN 978-0-472-11690-4. Retrieved 27 April 2013. ^ A. E. Bell, Christian Huygens (1950), pp. 65–6; archive.org. ^ Jonathan I. Israel (12 October 2006). Enlightenment Contested : Philosophy, Modernity, and the Emancipation of Man 1670–1752: Philosophy, Modernity, and the Emancipation of Man 1670–1752. OUP Oxford. p. 210. ISBN 978-0-19-927922-7. Retrieved 11 May 2013. ^ Lisa Jardine (2003). The Curious Life of Robert Hooke. HarperCollins. pp. 180–3. ISBN 0-00-714944-1. ^ Joseph Needham (1974). Science and Civilisation in China: Military technology : the gunpowder epic. Cambridge University Press. p. 556. ISBN 978-0-521-30358-3. Retrieved 22 April 2013. ^ Joseph Needham (1986). Military Technology: The Gunpowder Epic. Cambridge University Press. p. xxxi. ISBN 978-0-521-30358-3. Retrieved 22 April 2013. ^ Alfred Rupert Hall (1952). Ballistics in the Seventeenth Century: A Study in the Relations of Science and War with Reference Principally to England. CUP Archive. p. 63. GGKEY:UT7XX45BRJX. Retrieved 22 April 2013. ^ Gottfried Wilhelm Freiherr von Leibniz (7 November 1996). Leibniz: New Essays on Human Understanding. Cambridge University Press. p. lxxxiii. ISBN 978-0-521-57660-4. Retrieved 23 April 2013. ^ Marcelo Dascal (2010). The practice of reason. John Benjamins Publishing. p. 45. ISBN 978-90-272-1887-2. Retrieved 23 April 2013. ^ Alfred Rupert Hall (1886). Isaac Newton: Adventurer in thought. Cambridge University Press. p. 232. ISBN 0-521-56669-X. ^ Curtis ROADS (1996). The computer music tutorial. MIT Press. p. 437. ISBN 978-0-262-68082-0. Retrieved 11 May 2013. ^ "GroteKerkDenHaag.nl" (in Dutch). GroteKerkDenHaag.nl. Retrieved 13 June 2010. ^ "never married; from google (christiaan huygens never married) result 1". ^ Anders Hald (25 February 2005). A History of Probability and Statistics and Their Applications before 1750. John Wiley & Sons. p. 123. ISBN 978-0-471-72517-6. Retrieved 11 May 2013. ^ William L. Harper (8 December 2011). Isaac Newton's Scientific Method: Turning Data into Evidence about Gravity and Cosmology. Oxford University Press. pp. 206–7. ISBN 978-0-19-957040-9. Retrieved 23 April 2013. ^ R. C. Olby; G. N. Cantor; J. R. R. Christie; M. J. S. Hodge (1 June 2002). Companion to the History of Modern Science. Taylor & Francis. pp. 238–40. ISBN 978-0-415-14578-7. Retrieved 12 May 2013. ^ David B. Wilson (1 January 2009). Seeking nature's logic. Penn State Press. p. 19. ISBN 978-0-271-04616-7. Retrieved 12 May 2013. ^ Stephen Shapin; Simon Schaffer (1989). Leviathan and the Air Pump. Princeton University Press. pp. 235–56. ISBN 0-691-02432-4. ^ Deborah Redman (1997). The Rise of Political Economy As a Science: Methodology and the Classical Economists. MIT Press. p. 62. ISBN 978-0-262-26425-9. Retrieved 12 May 2013. ^ Tian Yu Cao (14 May 1998). Conceptual Developments of 20th Century Field Theories. Cambridge University Press. pp. 25–. ISBN 978-0-521-63420-5. Retrieved 11 May 2013. ^ Garber and Ayers, p. 595. ^ Peter Dear (15 September 2008). The Intelligibility of Nature: How Science Makes Sense of the World. University of Chicago Press. p. 25. ISBN 978-0-226-13950-0. Retrieved 23 April 2013. ^ The Beginnings of Modern Science, edited by Rene Taton, Basic Books, 1958, 1964. ^ Garber and Ayers, pp. 666–7. ^ Garber and Ayers, p. 689. ^ Jonathan I. Israel (8 February 2001). Radical Enlightenment:Philosophy and the Making of Modernity 1650–1750. Oxford University Press. pp. lxii–lxiii. ISBN 978-0-19-162287-8. Retrieved 11 May 2013. ^ a b Ernst Mach, The Science of Mechanics (1919), e.g. pp. 143, 172, 187 <https://archive.org/details/scienceofmechani005860mbp>. ^ J. B. Barbour (1989). Absolute Or Relative Motion? : The discovery of dynamics. CUP Archive. p. 542. ISBN 978-0-521-32467-0. Retrieved 23 April 2013. ^ A.I. Sabra (1981). Theories of light: from Descartes to Newton. CUP Archive. pp. 166–9. ISBN 978-0-521-28436-3. Retrieved 23 April 2013. ^ Richard Allen (1999). David Hartley on human nature. SUNY Press. p. 98. ISBN 978-0-7914-9451-6. Retrieved 12 May 2013. ^ Nicholas Jolley (1995). The Cambridge Companion to Leibniz. Cambridge University Press. p. 279. ISBN 978-0-521-36769-1. Retrieved 12 May 2013. ^ Christiaan Huygens, Traité de la lumiere... (Leiden, Netherlands: Pieter van der Aa, 1690), Chapter 1. ^ a b C. Huygens (1690), translated by Silvanus P. Thompson (1912), Treatise on Light, London: Macmillan, 1912; Project Gutenberg edition, 2005; Errata, 2016. ^ a b A. Mark Smith (1987). Descartes's Theory of Light and Refraction: A Discourse on Method. American Philosophical Society. p. 70 with note 10. ISBN 978-0-87169-773-8. Retrieved 11 May 2013. ^ Ivor Grattan-Guinness (11 February 2005). Landmark Writings in Western Mathematics 1640–1940. Elsevier. p. 43. ISBN 978-0-08-045744-4. Retrieved 23 April 2013. ^ Darryl J. Leiter; Sharon Leiter (1 January 2009). A to Z of Physicists. Infobase Publishing. p. 108. ISBN 978-1-4381-0922-0. Retrieved 11 May 2013. ^ Jordan D. Marché (2005). Theaters Of Time And Space: American Planetariums, 1930–1970. Rutgers University Press. p. 11. ISBN 978-0-8135-3576-0. Retrieved 23 April 2013. ^ C. D. Andriesse (25 August 2005). Huygens: The Man Behind the Principle. Cambridge University Press. p. 128. ISBN 978-0-521-85090-2. Retrieved 23 April 2013. ^ Marrison, Warren (1948). "The Evolution of the Quartz Crystal Clock". Bell System Technical Journal. 27: 510–588. doi:10.1002/j.1538-7305.1948.tb01343.x. Archived from the original on 13 May 2007. ^ Epstein/Prak (2010). Guilds, Innovation and the European Economy, 1400–1800. Cambridge University Press. pp. 269–70. ISBN 978-1-139-47107-7. Retrieved 10 May 2013. ^ Joella G. Yoder (8 July 2004). Unrolling Time: Christiaan Huygens and the Mathematization of Nature. Cambridge University Press. p. 152. ISBN 978-0-521-52481-0. Retrieved 12 May 2013. ^ Michael R. Matthews (2000). Time for Science Education: How Teaching the History and Philosophy of Pendulum Motion Can Contribute to Science Literacy. Springer. pp. 137–8. ISBN 978-0-306-45880-4. Retrieved 12 May 2013. ^ Lisa Jardine (1 April 2008). "Chapter 10". Going Dutch: How the English Plundered Holland's Glory. HarperPress. ISBN 978-0007197323. ^ "Boerhaave Museum Top Collection: Hague clock (Pendulum clock) (Room 3/Showcase V20)". Museumboerhaave.nl. Archived from the original on 19 February 2011. Retrieved 13 June 2010. ^ "Boerhaave Museum Top Collection: Horologium oscillatorium, siue, de motu pendulorum ad horologia aptato demonstrationes geometricae (Room 3/Showcase V20)". Museumboerhaave.nl. Archived from the original on 20 February 2011. Retrieved 13 June 2010. 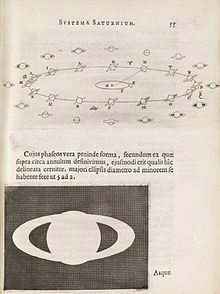 ^ Marin Mersenne 1647 Reflectiones Physico-Mathematicae, Paris, Chapter 19, cited in Mahoney, Michael S. (1980). "Christian Huygens: The Measurement of Time and of Longitude at Sea". Studies on Christiaan Huygens. Swets. pp. 234–270. Archived from the original on 4 December 2007. Retrieved 7 October 2010. ^ Matthews, Michael R. (2000). Time for science education: how teaching the history and philosophy of pendulum motion can contribute to science literacy. New York: Springer. pp. 124–126. ISBN 0-306-45880-2. ^ Thomas Birch, "The History of the Royal Society of London, for Improving of Natural Knowledge, in which the most considerable of those papers...as a supplement to the Philosophical Transactions", vol 2, (1756) p 19. ^ A copy of the letter appears in C. Huygens, in Oeuvres Completes de Christian Huygens, edited by M. Nijhoff (Societe Hollandaise des Sciences, The Hague, The Netherlands, 1893), Vol. 5, p. 246 (in French). ^ Antony Cooke (1 January 2005). Visual Astronomy Under Dark Skies: A New Approach to Observing Deep Space. Springer. p. 67. ISBN 978-1-84628-149-5. Retrieved 24 April 2013. ^ Philip C. Almond (27 November 2008). Adam and Eve in Seventeenth-Century Thought. Cambridge University Press. pp. 61–2. ISBN 978-0-521-09084-1. Retrieved 24 April 2013. ^ Juliet Cummins; David Burchell (2007). Science, Literature, and Rhetoric in Early Modern England. Ashgate Publishing, Ltd. pp. 194–5. ISBN 978-0-7546-5781-1. Retrieved 24 April 2013. ^ "Johar Huzefa (2009) Nothing But The Facts – Christiaan Huygens". Brighthub.com. 28 September 2009. Retrieved 13 June 2010. ^ Jacob, Margaret (2010). The Scientific Revolution. Boston: Bedford/St. Martin's. pp. 29, 107–114. ^ Russell Mccormmach (2012). Weighing the World: The Reverend John Michell of Thornhill. Springer. pp. 129–31. ISBN 978-94-007-2022-0. Retrieved 12 May 2013. ^ a b c d e f Verduin, C.J. Kees (31 March 2009). "Portraits of Christiaan Huygens (1629–1695)". University of Leiden. Retrieved 12 April 2018. ^ Verduin, C.J. (2004). "A portrait of Christiaan Huygens together with Giovanni Domenico Cassini". In Karen, Fletcher (ed.). Titan – from discovery to encounter. Noordwijk, Netherlands: ESA Publications Division. pp. 157–170. ISBN 92-9092-997-9. ^ L, H (1907). "Christiaan Huygens, Traité: De iis quae liquido supernatant". Nature. 76 (1972): 381. Bibcode:1907Natur..76..381L. doi:10.1038/076381a0. ^ Yoder, Joella (17 May 2013). A Catalogue of the Manuscripts of Christiaan Huygens including a concordance with his Oeuvres Complètes. BRILL. ISBN 9789004235656. Retrieved 12 April 2018. ^ Audouin, Dollfus (2004). "Christiaan Huygens as telescope maker and planetary observer". In Karen, Fletcher (ed.). Titan – from discovery to encounter. Noordwijk, Netherlands: ESA Publications Division. pp. 115–132. Bibcode:2004ESASP1278..115D. ISBN 92-9092-997-9. ^ Huygens, Christiaan (1977). Translated by Blackwell, Richard J. "Christiaan Huygens' The Motion of Colliding Bodies". Isis. 68 (4): 574–597. JSTOR 230011. 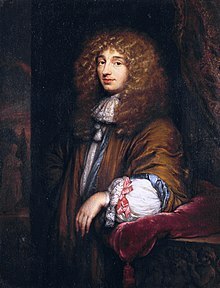 ^ "Christiaan Huygens, Oeuvres complètes. Tome XXII. Supplément à la correspondance" (in Dutch). Digitale Bibliotheek Voor de Nederlandse Lettern. Retrieved 12 April 2018. ^ Yoeder, Joella (1991). "Christiaan Huygens' Great Treasure" (PDF). Tractrix. 3: 1–13.